An artificial diffusion term is introduced locally to the Euler equations to deal with flow discontinuity and the consequential numerical oscillations. 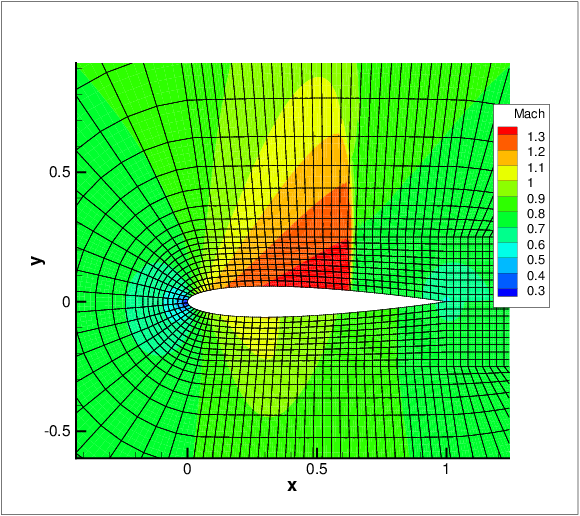 Two models are implemented, a non-smooth and a smooth artificial viscosity model. where Sκ is a normalised sensor value and serves as a forcing term for the artificial viscosity. 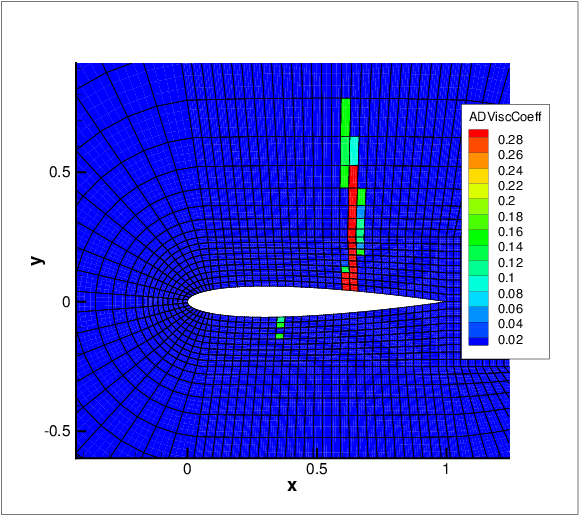 A smooth artificial viscosity distribution is obtained. where for now FH and FL are used to tune which range of the sensor is used as a forcing term and C1 and C2 are fixed constants which can be played around with to make the model more diffusive or not. However these constants are generally fixed. A sensor based p-adaptive algorithm is implemented to optimise the computational cost and accuracy. The DG scheme allows one to use different polynomial orders since the fluxes over the elements are determined using a Riemann solver and there is now further coupling between the elements. Furthermore, the initial p-adaptive algorithm uses the same sensor as the shock capturing algorithm to identify the smoothness of the local solution so it rather straightforward to implement both algorithms at the same time. The polynomial order in each element can be adjusted based on the sensor value that is obtained. Initially, a converged solution is obtained after which the sensor in each element is calculated. Based on the determined sensor value and the pre-defined sensor thresholds, it is decided to increase, decrease or maintain the degree of the polynomial approximation in each element and a new converged solution is obtained. For now, the threshold values se, sds, ssm and sfl are determined empirically by looking at the sensor distribution in the domain. Once these values are set, two .txt files are outputted, one that has the composites called VariablePComposites.txt and one with the expansions called VariablePExpansions.txt. These values have to copied into a new .xml file to create the adapted mesh.